Description Custom painted 1982 Kramer Pacer. I had it painted in 2000 a very deep purple with a flame (like you would see on a chopper) on the upper portion. 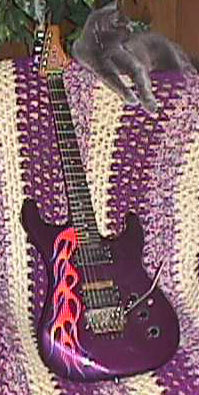 I also had my name LOGAN painted on the headstock in cursive writing. On the inside of the electronics compartment is a tag with numbers on it that only I know what they mean. Above the bridge pickup is a trophy name plate with my name on it also. I owned this guitar for 20 years and it was my baby. It was stolen out of my house by a man named CAMERON WOODS who is a keyboard player with a very bad drug habit. He has not been seen since the theft took place. It is my belief the guitar is in California or Texas and unless it was stripped of the paint there is no other guitar that looks like this one. It is one-of-a-kind.